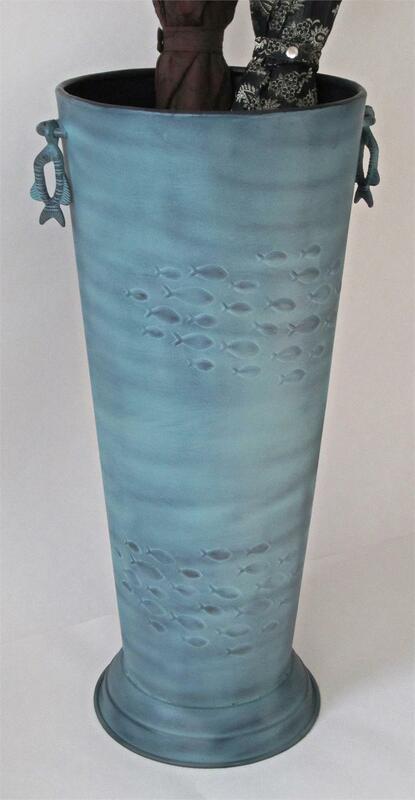 Iron umbrella stand with embossed fish design in seawash blue color. Height 21," Diameter 9" (measured across top opening). Heavy weighted base reduces the possibility of tip-over even when storing tall umbrellas. The baked-on powder-coating finish is hand detailed to produce an ocean current effect. Cast handles in fish shaped design. Finishes may vary slightly as each piece is hand-detailed.